Pneumonia during pregnancy, known as maternal pneumonia, not only endangers the woman who has it, but it can have consequences for her baby, including an increased risk of preterm birth and low birth weight. There are more than 30 different causes of pneumonia. You can get pneumonia from a bacterial infection or a virus, such as the flu, chickenpox or shingles; or even fungi. People often develop pneumonia after they contract a cold or the flu. Exposure to germs raises the risk of contracting pneumonia. Pregnant women are cautioned to avoid sick people since germs can be spread by sneezing, coughing or talking, even by laughing. Avoiding direct physical contact is not always effective since germs, once airborne, can spread within a six-feet radius. Working in some professions increases the risk of exposure. For example, working with young children or spending long periods of time in hospitals or nursing homes can expose a pregnant woman to more of the bacteria or viruses that lead to pneumonia. Some preexisting conditions also add to a woman’s vulnerability. If a woman smokes, has asthma, has a weakened immune system, or anemia, she may be more vulnerable to developing a lung infection and having complications. 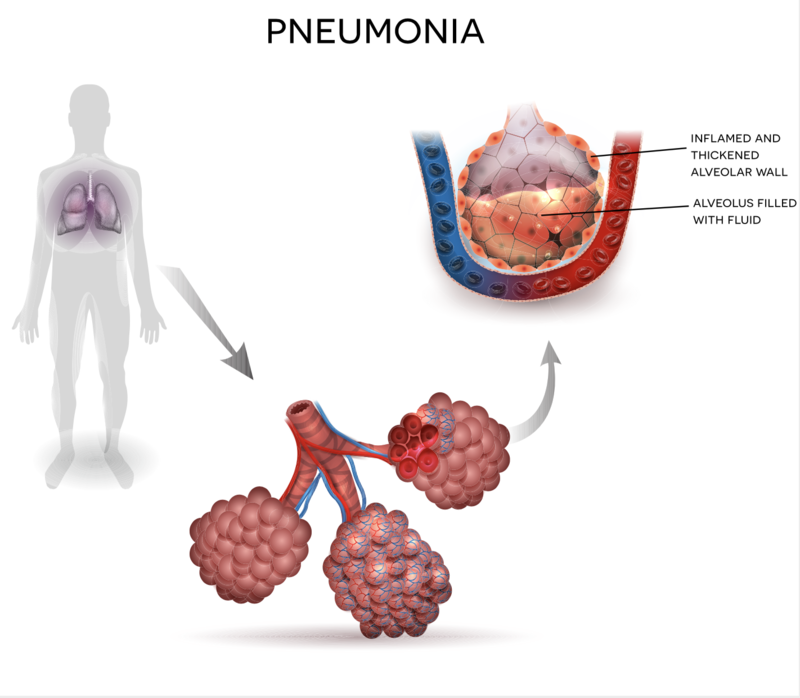 Pneumonia can also worsen chronic conditions that affect the lungs and heart. Any type of respiratory illness during pregnancy should prompt a trip to the doctor. To determine if it is pneumonia and how to best treat it, your doctor may ask questions about the nature and severity of your symptoms, listen to your lungs, give you a blood test, sample fluid from your lungs to find the source of the infection, then give you a chest X-ray to determine where the infection is located. Catching pneumonia early improves the chances of a quick recovery and can minimize the amount of time required for treatment. What should you do if you have pneumonia? The treatment for pneumonia depends on the cause of the infection. Bacterial pneumonia requires antibiotics while viral pneumonia is treated with antiviral drugs. Neither may respond well to pneumonia caused by a fungus, which requires anti-fungal treatment. Many antibiotics are considered safe for use during pregnancy, as are most anti-viral treatments. Your doctor may also recommend respiratory therapy, such as using a bronchodilator, to help you breathe. While over-the-counter medications can be used to help reduce pain and fever, be sure to discuss the use of any over-the-counter medications with your doctor. Recovering from pneumonia also requires bed rest and drinking lots of liquids. Mild cases can be treated at home with medication and rest. 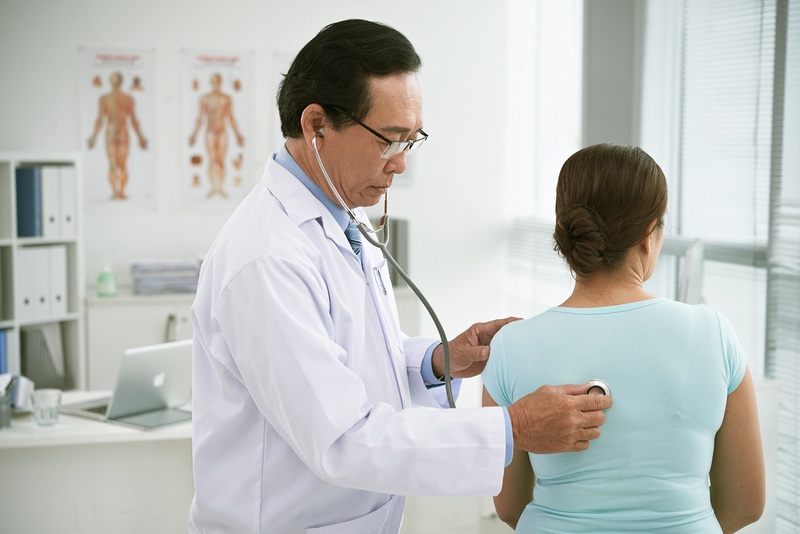 Severe or complicated cases may require hospitalization, if there is a need for supplementary oxygen and other support systems that keep the body functioning efficiently. Sometimes surgical intervention is required to clear the lungs. Be sure to finish any treatment your doctor prescribes. Stopping antibiotics halfway through a treatment, for example, could slow your recovery and result in your becoming even sicker. To prevent spreading germs to other members of your family, wash your hands often. Cough or sneeze into tissues. Don’t share utensils, towels or your toothbrush. The best and safest way to treat pneumonia is to not get it at all. Fortunately, there are ways to reduce your risk. First, talk to your doctor about getting the flu shot, which can help prevent infections that often lead to pneumonia. Wash your hands frequently, especially if you work with small children, or in hospitals or nursing homes. If possible, avoid contact with people who are sick. Work at staying healthy by eating nutritious food and getting enough sleep. Don’t smoke. While most people recover from pneumonia, it can be fatal, so do take possible symptoms seriously. Do what you can to reduce your risk and, if you develop possible pneumonia symptoms, report the symptoms to your doctor. Episiotomies – The Kindest Cut or the Unkindest? An Abnormal Pap Test Result During Pregnancy? Don’t Panic! Treating Depression in Pregnancy: What’s New?